Welcome! I’m a firm believer in the power of the mind, and the role it plays in our physical well-being. the job becomes much less daunting. Day 1: We’re All In This Together! I was inspired to take part in a challenge called “Write 31 Days”, which annually takes place in October. Since I “joined the movement” late, my challenge will last into November, but nonetheless it will be 31 posts. For 31 days, I am going to take a journey with you…one that will challenge not only you, but me too. Because, guess what? Even those of us who dedicate our careers to helping others better themselves, experience struggle at times…take me for example. I have been solely dedicated to the field of wellness–physical, emotional, and spiritual–for well over 20 years. Does that mean that I’ve had no circumstances in which my emotions were all over the place? No way! Has my spiritual life led me to ask some tough questions of myself and my faith? Absolutely! And have I been free from physical ailments? The answer to that is obvious to those of you who know my story…but if you do not, the answer is a resounding “no”! Since dedicating my education and career to this, I have been diagnosed with cancer not once, but 3 times. Now wait a minute…before you dismiss me and say “Why, then, should I listen to what you have to say?”, let me tell you this. First of all, I am human, and you and I most likely have a lot in common (besides just the “human” part)! ANYONE in the business I am in can tell you that they’re different from most, and that their lives have been transformed completely for good (a common claim made in similar industries). When I hear or read that from someone, I immediately feel that there is no authenticity in what that person says. When teachers, consultants, therapists, coaches, and others tell you that they never again had to deal with “xyz” once they _____ (fill in the blank: discovered a new product; found Jesus; created a program to help themselves; you name it)…they are not being truthful. God CREATED us to make mistakes in our humanity, to struggle, to seek wise counsel from our mentors and those we look up to and trust. We were created to GROW on our individual journeys, to learn from others and ourselves (through reflection, asking the tough questions of ourselves, speaking with trusted friends, etc.). It is my belief that growth only happens when we experience things that challenge us as people. 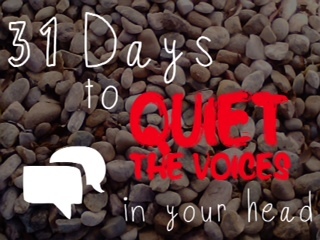 It happens when we take the time to really listen to those voices in our head, where our negative beliefs have taken up residence….and begin to QUIET those voices. And at first, there may be resistance, as it’s not what you’re used to doing! I will help you chip away at that resistance, and battle the negativity that is stealing your joy. You may click on the links below when they go live each day. Enjoy! Day 7: C’mon, Just Drop On In…You’re Not A Pain! Day 10: Lessons In Self-Image, From a Cactus?! Day 11: What Wine Pairs Best With a Fun-Size Snickers? Day 12: What Does Your Home Say About You? Day 14: Mix It Up, Just Like Tom Cruise! Day 28: Death By Voodoo: Is It Really Possible?